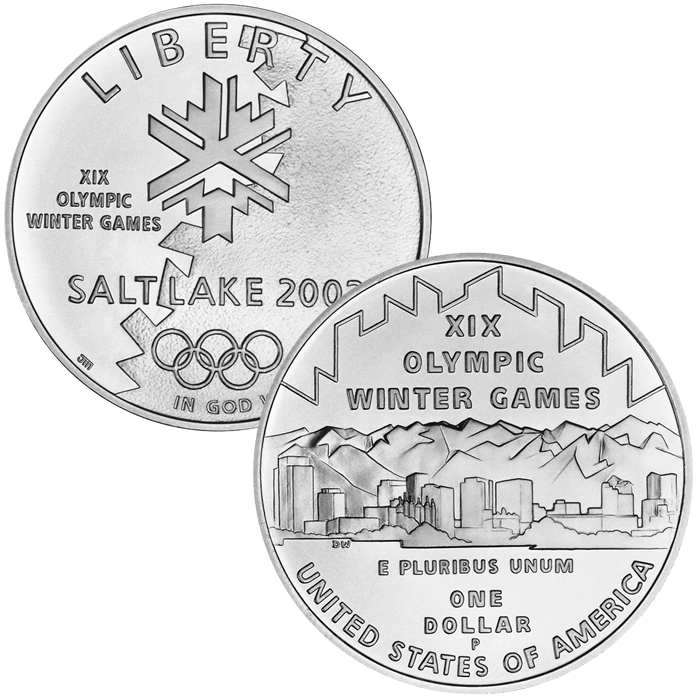 The 2002-P Olympic Winter Games Commemorative Uncirculated Silver Dollar was issued by the US Mint to commemorate the Winter Olympic Games being held that year in Salt Lake City, Utah. Held in February of that year, the games were a continuation of the multi-sporting event competition first held in 1924. In those games, several events were held that can trace their roots directly back to the first Winter Olympics. Examples include alpine skiing and hockey. A proof version of this Silver Dollar was also struck by the US Mint. 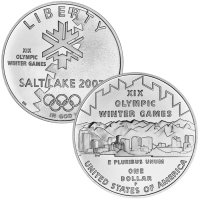 Proceeds raised from surcharges on the coins were forwarded to the Salt Lake Organizing Committee for the Olympic Winter Games of 2002 and the United States Olympic Committee. Struck from 90% silver, each Olympic Silver Dollar has a diameter of 1.5 inches. The US Mint released the Uncirculated Olympic Coin in late 2001. The initial price charged for the Olympic Proof Coin was $30.00. Each Olympic Silver Dollar was struck at the US Mint’s facility in Philadelphia and show the ‘P’ mintmark. The obverse (heads side) of the coin shows the crystal emblem of the 2002 Olympic Winter Games against the "rhythm of the land" emblem with the Olympic Rings shown below. It was designed by John Mercanti. Showing the skyline of Salt Lake City including the outline of the Rocky Mountains in the background, the reverse (tails side) was designed by Donna Weaver.